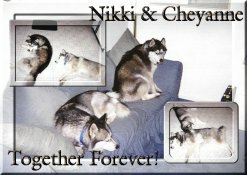 Nikki and Cheyanne went home on February 9th, 2001! Yes that's right! 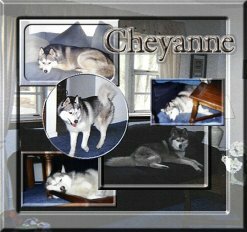 Nikki and Cheyanne found the home they have been searching for--a home with no cats and people with the patience and time to build them a fortress. These two spirited girls found a wonderful new home with John and Michelle. These two girls were searching low and high for their new home and when they did find their home, they hit the jack pot! 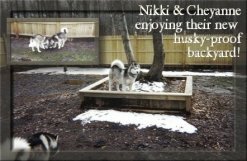 To their dismay, they checked the fence all over and couldn't find a weakness ... Sibe-proof! Well they have the rest of their lives to try and see if they can find a weakness, but so far the only weakness they have found is their new owners hearts. You can see here how much these two are enjoying their new home!